Brush Wizard: More AdMech Progress! 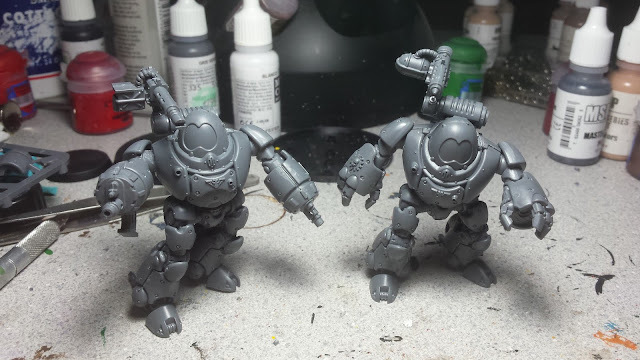 Slow bit of progress on the AdMech so far, this week (I found myself gravitating toward Super Dungeon Explore painting instead). Batch painting isn't really my thing, so I tend to get tired of it quickly. But I do have a little bit of progress to report. The backpacks for the Rangers are mostly finished and I started blocking in the neutral grey for the base coats of the silver areas. These will be painted with Ironbreaker and Runefang steel for the silver sections. I also started blocking in the colors for the rifles. Then it's just a matter of small details and the insides of their robes. Skitarii Rangers and Vanguard on them and really like the way the look on the larger bases. Plus it gives me a bit more real estate for basing. I kinda burned myself out a little bit on them thanks to the wet blending of their robes. So I sat them aside and began playing with the Onager again. I decided which way I wanted it's legs to be and which direction that it would be facing. 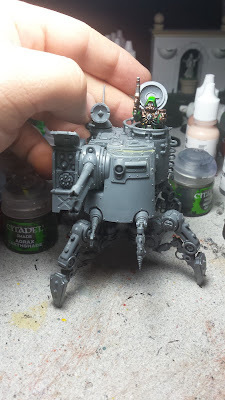 I was all excited to work on it, but then the Finger Painters challenge for this month ended up being Mecha, Cyborgs and Robots, so I set the Onager aside and assembled the Kastelean Robots. These are some sweet robots! There is a pretty solid range of motion in their waist and arms. But their legsare a bit static to start with. If I get more kits, I'll be doing some mods to get different stances out of them. A while back I finally picked a theme for my bases. So while I was trying to figure out a color scheme, I broke out the milliput and molded up a bit of swampy terrain. 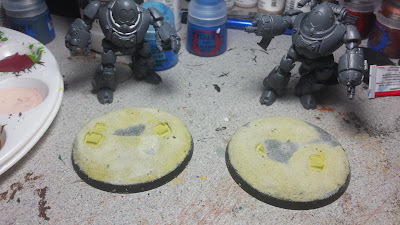 I even put the robots into place on top of the wet putty, which will make it look more like the heavy robots are sinking into the swampy muck. I decided to paint the Power Fist robot first. 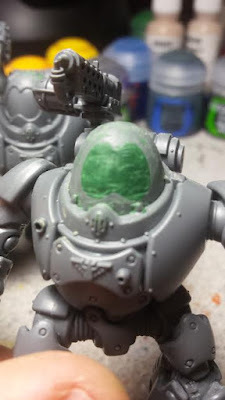 But before I got started, I decided to green stuff the face plate of the helmet to make it a smooth dome. I also cut all the little nubs off and filed it all as smooth as I could. Now it's time for paint, which I'm already pretty far along. But that would make this post way too long. So we'll get that up in the next few days. 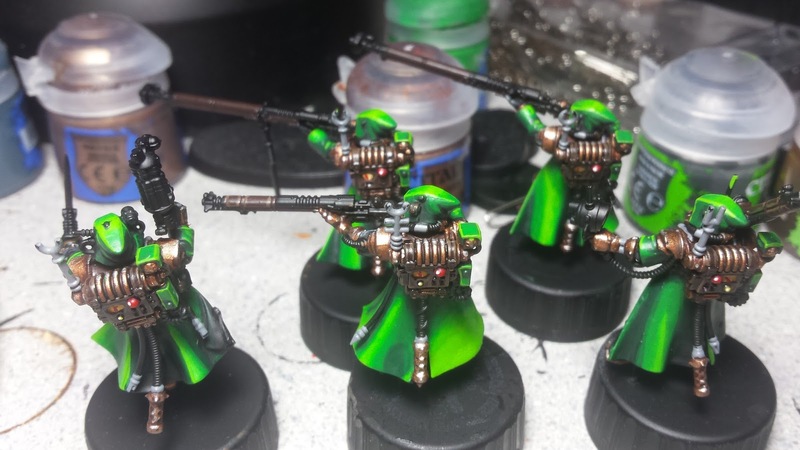 AdMech Skitarii - Finally Starting on the Army.